This impressive home sits in a beautiful spot overlooking the river. Set in a peaceful but not isolated setting afforded a good degree of privacy. Offered by the current vendors in immaculate order with spacious rooms and a high-quality finish throughout. The accommodation extends to approx 210m2 of living space. Set high above the river in delightful gardens and grounds with stunning views an in-ground pool ideal for hot summer days. The property is situated between Availles Limouzine and L’Isle Jourdain, both towns on the banks of the Vienne with shops, bars, cafes, and all amenities. For those who need easy access to and from the UK, year-round low cost flights are available at both Limoges and Poitiers which are approx. one hour drive. Dining Hall: With wood flooring, a door onto the terrace, the original fireplace with a new wood burning stove with stairs rising in a graceful curve to the first floor. Kitchen / Breakfast Room: Spacious modern well equipped kitchen with tiled floor, an island unit, double doors onto the terrace and room for a dining table to seat 8 comfortably. The kitchen is fitted with fridges, freezer, dish-washer, compartment for a microwave oven, a black granite worktop and an electric Aga. No expense has been spared so you be sure of the highest quality.Sitting Room: Magnificent, light, airy, double-aspect sitting room with an inglenook fireplace one end. The floor is engineered oak with underfloor heating. Wood burning stove. Three windows look out to the river, where you can sit and admire the superb views. Exposed beams. Utility room: Utility room with Amtico flooring and oak units topped with black granite same as is in the kitchen. To the right, is a shower room. Central Heating System. Cinema Room / Bedroom 4: Another charming light and airy room, carpeted, beamed ceiling, would serve as a TV room or 4th bedroom. The ground floor layout may offer the flexibility to create a small self-contained annex. Landing with doors to all rooms and carpeted throughout. 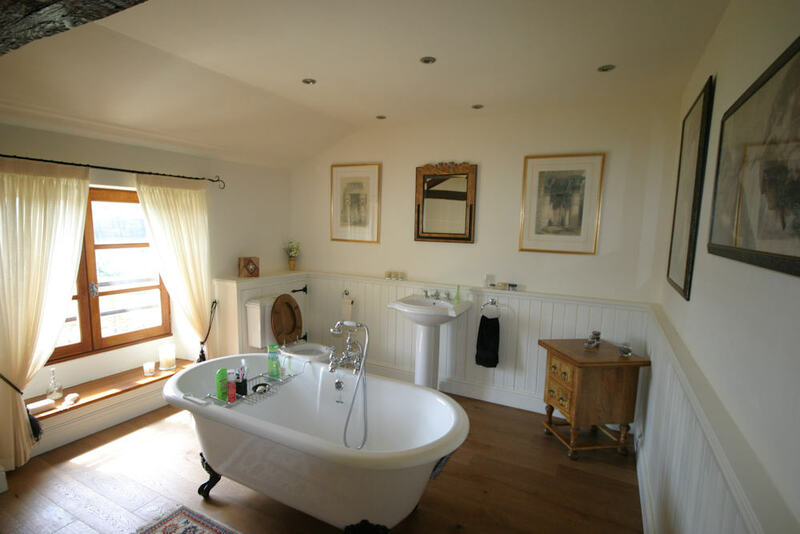 En-suite bathroom: Lovely and spacious with free standing bath in the centre giving a view while you bathe, over the river. Bedroom 2: A double bedroom with old beams, and a low window with safety bars, looking out over the river. Family shower room: Newly fitted with a high-quality finish. Bedroom 3: Another double bedroom with beams, a fitted wardrobe, and a low window with safety bars over-looking the river. In Ground Pool – Lovely pool with terrace surround, perfect for lazy summer days. The property benefits from central heating and is double glazed throughout.